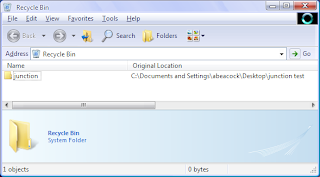 Ever since I started developing using Unix machines I've wanted symbolic links in Windows XP. A recent pursuit of backup solutions left me really wanting symbolic links so I started the search. This blog post gave me everything I needed, using a tool from Microsoft's website called junction. 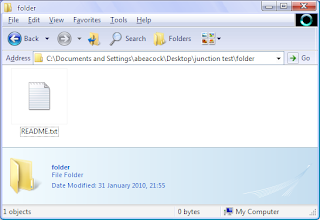 This command line tool created junction points between a symbolic name and a real folder on your hard drive (sorry network drives cannot be linked to). 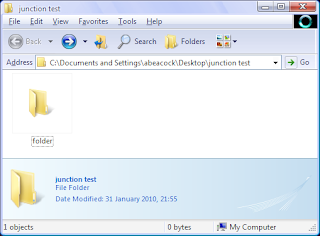 I downloaded it and placed the junction.exe file in my C:\WINDOWS\system32 directory so it would be on my system path. Below is my little walk-through of how to use junction. 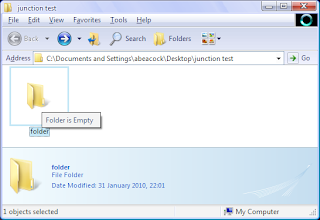 So as you can see the contents of the "folder" directory is now available in via the "junction" directory as well. Obviously the junction doesn't need to be next to the folder you want to link too (that would be of little use) but it can be anywhere on your harddrive (I was using it to point into my DropBox sync folder). So please remember to always use the junction command to create & delete junctions, you can also use it to show you which directories are actually junctions so you know if you should delete it or not, refer to the junction download page for more details. Are your Maven profiles being picked up as 'default'? After some searching we found this maven-users mailing list post detailing the solution. Once we saved that change in our settings.xml file the profile was picked up as the default.